Needle EMG may be negative in mild or predominantly sensory lumbosacral radiculopathies. In such cases, an increase in the latency of the soleus H-reflex is a useful diagnostic criterion for establishing sensory fiber compromise at the S1 root level. However, if clinical signs of radicular involvement are lacking, the latency of the H-reflex is normal. 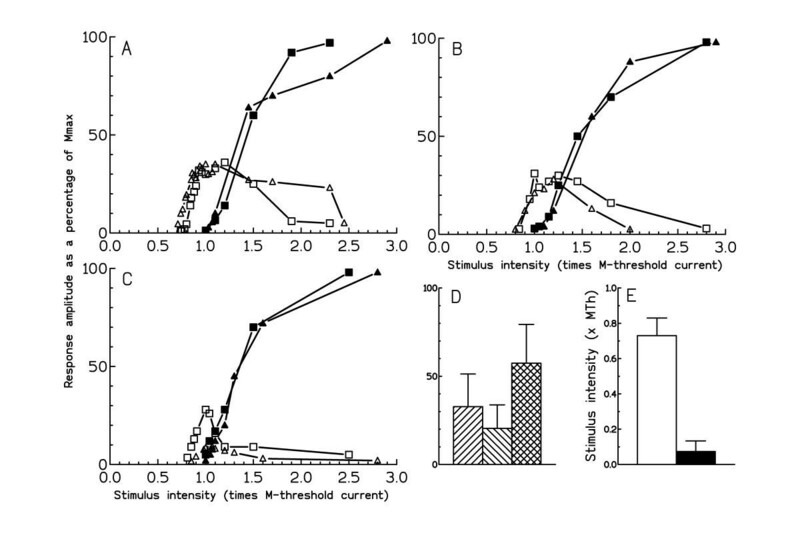 We therefore studied the recruitment curve of the soleus H-reflex to investigate whether a change in the electrical threshold for eliciting the H-reflex might be a more sensitive criterion for detecting subclinical S1 root dysfunction. Clinical and electrophysiological findings from 26 patients with chronic back pain and radiculopathy were compared with data obtained from 40 healthy subjects. An increase in the mean H-reflex threshold was the only abnormal electrophysiological finding in patients with no clinical sign of root injury (58%). A decrease in the mean H-reflex amplitude and a prolongation of H-reflex latency was observed in patients with radicular signs (42%). In both patients groups, F-wave and needle EMG studies were normal. No radiological evidence of S1 root compression was found. The study of the recruitment curve of the soleus H-reflex may be usefully associated to F-wave and needle EMG studies to detect possible S1 root dysfunction in mild lumbosacral radiculopathies. An increase in H-threshold may be the earliest abnormality in the absence of focal neurological signs. In patients with chronic low back pain, it is important to establish whether or not radiculopathy is present. This is not difficult when clinical, radiological and electromyographic abnormalities consistent with focal nerve root involvement are found. However, a high percentage of the patients referred to back pain clinics presents with leg pain only. The neurological examination may be normal or confusing showing nonradicular sensory changes or minimal reflex decrement. Imaging studies may lack diagnostic specificity. Needle EMG, which tests only ventral root function, may be normal in the absence of motor symptoms. We have recently reported prolongation of the latency of the soleus H-reflex as the only abnormality revealed by standard electrodiagnostic procedures in patients with lumbar spondylolisthesis. This finding implies that the H-reflex test is an essential diagnostic criterion for radiculopathy, especially when clinical and electrophysiological signs of motor root involvement are lacking. However, one important diagnostic limitation of the H-reflex test was that its latency was not sensitive enough to detect subclinical nerve root dysfunction; i.e., a prolonged H-latency was noted only when clinical signs of root injury were manifest. We therefore investigated whether the recruitment curve of the soleus H-reflex might be a further diagnostic criterion for assessing S1 root function in patients with chronic back pain and radiculopathy. This procedure basically consists of establishing the electrical threshold necessary for eliciting the H-reflex which depends on the activation of the most excitable Ia afferent fibers. Since these fibers are most susceptible to compression – or ischemia-induced effects, a significant increase in the threshold for the H-reflex may be suggestive of partial conduction block or differential slowing of conduction, not yet affecting the latency of the H-reflex. In the absence of peripheral nerve lesion and CNS involvement, it seems reasonable to assume that any possible abnormality of the H-reflex may be indicative of injury at root level. Some of the results were published previously in abstract form. We selected for this study 26 patients (mean age 44 ± 10, age range 25–62; mean height 166 cm ± 12, height range 150–187). Six of these patients had been included in our previous report. All patients had a history of chronic back pain, lasting more than six months and radiating no further than the buttock, and lumbosacral radiculopathy, defined as pain radiating into the lower limbs. These patients had no history or clinical signs suggesting vascular or systemic diseases, and no clinical or electrophysiological signs suggesting pathological conditions such as myelopathy, polyneuropathy, myopathy or neuromuscular transmission disorders. The patients were examined with plain radiographs, computed tomography scans and magnetic resonance imaging of the lumbosacral spinal tract. Radiographic data were gathered from the reports made by experienced neuroradiologists who had no clinical information available. For purposes of this study, computed tomography and magnetic resonance findings were defined as abnormal if there was evidence of nerve root impingement. All patients underwent bilateral nerve conduction studies, EMG and late response (F-wave and H-reflex) testing. All tests were performed by the same electromyographer. Positive EMG signs included: a) abnormal spontaneous activity in at least two areas of the examined muscle; b) long duration motor unit action potentials, and c) decreased recruitment pattern. Ten F wave responses were recorded from the extensor digitorum brevis muscle and flexor hallucis brevis muscle ("marker" muscles for L5 and S1 roots) after supramaximal stimulation of the peroneal nerve and tibial nerve at the ankle, respectively. The parameter we considered was the latency of the shortest F response. For determination of the soleus H-reflex, subjects were examined in the prone position. Surface electrodes on the soleus muscle recorded the H reflex and the direct muscle response (M wave). The H-reflex was evoked by percutaneous bipolar stimulation of the tibial nerve in the popliteal fossa. Stimulus duration was 1 ms and stimulus frequency 0.2–0.1 Hz. By adjusting the position of the stimulating electrode (cathode being proximal), the site with the lowest threshold for the H reflex was identified. Stimulus intensities were increased in steps of 0.2–0.5 mA until the maximum H-reflex amplitude was obtained, and in steps of 2–5 mA until the maximum M-wave size was obtained. H-recruitment curves were constructed by normalizing stimulus currents and response amplitudes. Peak-to-peak amplitudes were expressed as a percentage of the maximum M wave amplitude (Mmax). Stimulus intensity was expressed as a multiple of the M wave threshold (MTh), i.e., the minimum stimulus intensity required to obtain an M-wave of an amplitude of 0.2 mV. This enabled a comparison of individual stimulus-response relations between normal subjects and patients. As further control, threshold intensity for the H-reflex was also measured with respect to the intensity at which the M-wave reached 50% of its amplitude. We measured the minimum intensity required for eliciting an H-reflex of 0.2 mV (H-threshold), the amplitude and latency of the H-reflex at MTh and the amplitude of the H-reflex and M-wave at 1.5 MTh. The ages and heights of each patient were recorded. The data was stored on floppy disk for later analysis using a commercial EMG/EP machine (Medelec "Sapphire", Old Woking, Surrey, UK). The control group included 40 healthy subjects, mostly recruited from the hospital staff, with no previous or current history of disease, in particular back pain and radiculopathy. They were selected on an age and height basis so as to be matched with the patient population (mean age 40±10, age range 22-63; mean height 167±12, height range 145-182). Physical and neurological examination were normal. Linear regression lines were determined for H-reflex latencies as functions of height and age. Mean values and standard deviations were determined for H-reflex latency, interleg difference in H-latency, H-threshold and interleg difference in H-threshold, H-amplitude at MTh, H- and M-amplitude at 1.5 MTh. Normal data was compared to that obtained in patients using the unpaired Student’s t-test. In three subjects, recruitment curves were repeated during the same experimental session to ensure reproducibility of the results. None of the subjects underwent needle EMG. Control values for nerve conduction velocity and F-wave latency were taken from the lab reference data. Control values for the soleus H-reflex and M-response are shown in Table 1. The mean H-reflex latency was 30.6 with a range of 26.7 to 34.5 ms. The mean interside difference in latency was 0.33 (SD 0.27); the maximal interside difference in latency was 1ms. H-reflexes were well correlated with height, the coefficient of correlation being r = 0.78. 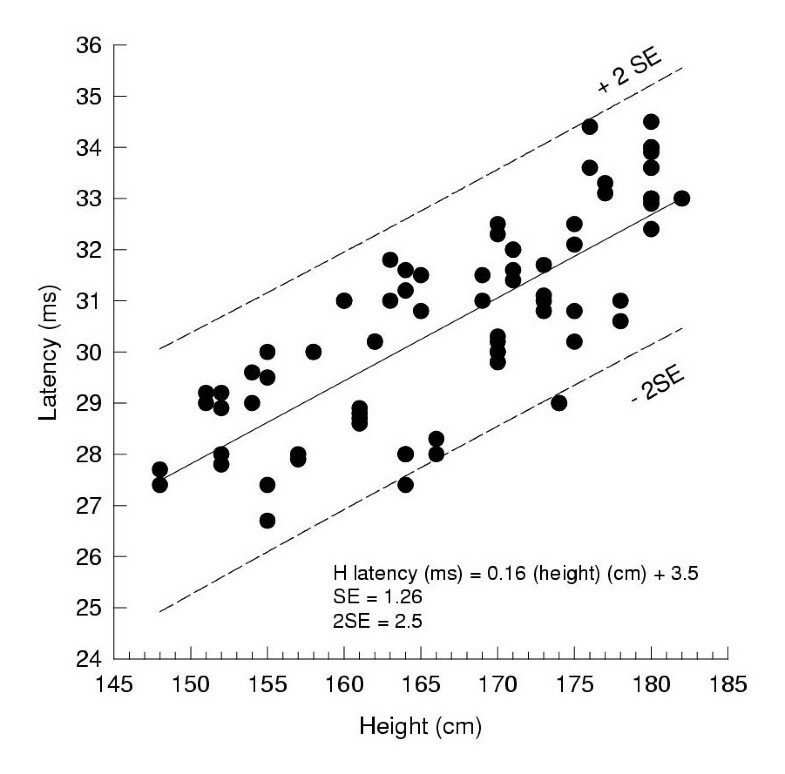 Linear regression lines were determined for H-reflex latencies as function of height and this correlation is illustrated in Figure 1. H-reflex latencies and age were not correlated (r = 0.1), probably because of the narrower range of age of our population. Figure 2A,B,C shows the H-reflex (empty symbols) and M-wave (filled symbols) recruitment curves obtained from three different subjects. The H-reflex threshold, i.e., the minimum afferent stimulation for eliciting this response was much lower than the M-wave threshold. The size of the H-reflex grew steeply with increasing stimulation intensity. The H-reflex maximum amplitude generally coincided with the appearance of the M-wave, after which it decayed in parallel with the progressive increase in the size of the M-wave. The mean H-reflex amplitude obtained at MTh and the mean H- and M-wave amplitude obtained at 1.5 MTh are reported in Table 1. These values are also shown as histograms in Figure 2D. The mean interside difference in the size of the H-reflex at MTh and at 1.5 x MTh was 0.5 (SD 0.9) and 2.45 (SD 2.5), respectively. The mean H-threshold intensity value was 8.1 mA (SD 3.0). The mean M-threshold intensity value was 13.5 mA (SD 5.4). The mean H-reflex threshold expressed with respect to the MTh was 0.6 (SD 0.06); the mean difference in the threshold of the H-reflex between the two sides was 0.03 (SD 0.03). Both values are shown as histograms in Figure 1E. The mean intensity value at which the M-wave reached 50% of its size was 20.7 mA (SD 9.5). This corresponded to about 1.5 x MTh. The mean H-threshold expressed with respect to 1.5 x MTh was 0.42 (SD 0.09). Relationship between height and latency of soleus H-reflex in controls. The regression was computed using the response values obtained from both legs. Control H-reflex recruitment curves and relative mean values. A,B,C: Normalized bilateral H (empty symbols) and M (filled symbols) recruitment curves in three different healthy subjects. The amplitude of H- and M- responses, both expressed as a percentage of the maximal M-wave amplitude, are plotted as a function of the stimulus intensity, expressed as a multiple of the M-wave threshold. Squares and triangles represent left and right side, respectively. D: mean values of H-amplitude measured at motor threshold (left diagonal bar), and of H- (right diagonal bar) and M-amplitude measured at 1.5 × motor threshold (crossed bar) in the healthy subjects. All values are expressed as a percentage of the maximal M-wave size. Vertical bars indicate 1 S.D. E: mean values of H-threshold (empty bar) and interside threshold difference (filled bar) in the healthy subjects. All values are expressed as a multiple of the M-wave threshold. Vertical bars indicate 1 S.D. The patients could be divided in two groups (see Table 2) according to whether they presented with symptoms only, but no focal neurological sign (Group 1, Cases 1–15) or whether they presented with clinical signs (Group 2, Cases 16–26). These included reflex changes and sensory abnormalities. Strength of lower limb muscles was found normal. No muscle atrophy was present. All patients were affected by low back pain. In 8 of them (31%), the pain radiated no further than the buttock, while in the remaining 18 (69%) it associated with limb pain. Median duration of lumbar pain was 8 years (range 1–30), while median duration of limb pain was 5.5 years (range 0.5–10). Limb pain was aggravated by standing in most of the patients. The Lassegue sign was present bilaterally in 3 patients (Cases 7, 8, 15) associated with paraspinal muscle anti-algic contraction. Limitation of motility was present in 4 patients (Cases 23-26). Spondylolisthesis was the common radiological mark with the exception of Cases 1–4 and Cases 22–23 (see Table 2). In the majority of patients, the slippage was between 2–9 mm. Isthmic spondylolisthesis at the fifth lumbar level was prevalent in Group 1 patients, probably because of their younger age. Degenerative spondylolisthesis, mostly at the fourth lumbar level, was observed more frequently in Group 2 patients. CT/MRI findings showed no abnormalities in Group 1 patients, while moderate degenerative changes of the discs and of the posterior elements of the spinal canal causing no root compression were observed in Group 2 patients. The individual values of H-latency are reported for all the patients in Table3. When compared with the control values expressed in the regression line as a function of height (Figure 1), H-latency values were normal in the patients with no clinical signs (Group 1). However, the H-recruitment pattern of these patients showed some important differences with respect to control findings (see Table 3). Figure 3A, 3B, 3C shows the H- and M-wave recruitment curves of three representative patients (Cases 2, 3, 9). A bilateral increase in the H-reflex threshold (empty symbols) is evident. Although a one-side reduction of the H-reflex amplitude can be noted in Figure 3A and 3B, there was no significant difference (t = 1.15, p = 0.25) in the mean H-reflex amplitude measured at motor threshold between controls and Group 1 patients (see also Table 1). 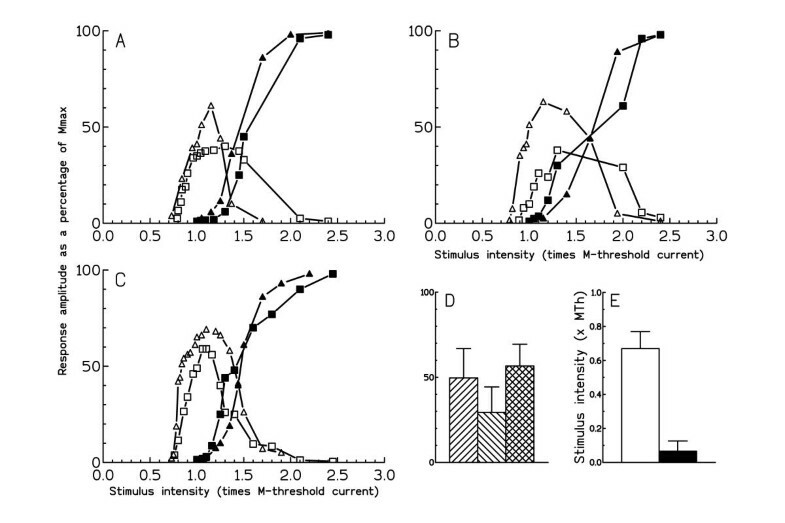 Also, there was no significant difference in the amplitude of both the H-reflex and M-wave measured at 1.5 MTh as compared with control values (see histograms in Figure 3D and Table 1). The increase in the H-reflex threshold noted in the single patients (Figure 3A, 3B, 3C) was confirmed by comparing the mean value of the H-reflex threshold between normal subjects (0.6 ± 0.06) and Group 1 patients (0.67 ± 0.1). This is shown in Figure 3E. The difference was highly significant (t = 3.8, p < 0,001). Also, the mean interside difference in the H-threshold was significantly greater (t = 2.56, p = 0.02) in these patients (0.07 ± 0.06) as compared to control values (0.03 ± 0.03). Statistical comparison of mean H-threshold current intensity values showed no significant difference (t = 1.75, p = 0.08) between control subjects and patients (see Table 1). A slow rising amplitude of the M-wave after MTh can be noted particularly in Figure 3A. It might be speculated that loss of excitability in some large motor axons could be responsible for this behaviour. To exclude the possibility that changes in the motor threshold might affect the measurements of the H-reflex threshold, H-threshold intensity values were also expressed with respect to the intensity at which the M-wave reached 50 % of its amplitude. This value was very near 1.5 x MTh when related to the motor threshold. This further measurement also produced a statistical significant difference (t = 4.0, p < 0.001) between patients (mean 0.49, SD 0.1) and controls (mean 0.42, SD = 0.09). It is worth noting that the absolute intensity values to obtain the M-wave at threshold and at half-maximal size were very similar between control subjects and patients. No other electrophysiological abnormality was found. In the patients with focal clinical signs (Group 2), the electrophysiological changes could be differentiated as follows: 1) Cases 16-22 not only showed a significant increase (t = 5.6, p < 0.001; t = 2.37, p < 0.02) in the mean H-reflex threshold (0.73± 0.1) and mean interside difference in H-threshold (0.07 ± 0.06), respectively but also a significant decrease (t = 2.56, p < 0.01) in the mean H-reflex amplitude at MTh (33 ± 18), as compared with control values (see Table 1). Such behaviour is illustrated in Figure 4A,B,C where the H- and M-wave recruitment curves of three representative subjects (Cases 19, 20, 22) are shown together with the average H-amplitude and H-threshold at MTh (Figure 4D,E). There was no significant difference in the amplitude of the H-reflex and M-wave measured at 1.5 MTh as compared with control values (Figure 4D and Table 1). No other electrophysiological abnormalities were found, 2) Cases 23–26 showed a significant bilateral increase in the latency of the H-reflex when compared with control values (cf. with Fig. 1). Because of this, their H-threshold and H-amplitude values were not included in the computation of the mean H-threshold and H-amplitude of Group 2 patients. The increase in H-latency was not associated with signs of motor root dysfunction, since the F-wave latencies from the flexor hallucis brevis muscle and from the extensor digitorum brevis muscle as well as the needle EMG of lower limb and lumbar paraspinal muscles were normal (not illustrated). Group 1 H-reflex recruitment curves and relative mean values A,B,C: Normalized bilateral H (empty symbols) and M (filled symbols) recruitment curves for three patients with no focal neurological signs (Group 1, Cases 2,3,9). D and E: Mean values for Group 1 patients. Legend as in Fig. 2. Group 2 H-reflex recruitment curves and relative mean values A,B,C: Normalized bilateral H (empty symbols) and M (filled symbols) recruitment curves for three patients with focal neurological signs (Group 2, Cases 19,20,22). D and E: Mean values obtained from Cases 16–22 who showed a normal H-latency. Legend as in Fig. 2. Height = cm; latency = ms; interside 1 = left (L) right (R) latency difference; threshold = multiples of motor threshold (x MTh); interside 2 = L/R threshold difference; Size* = % of maximal motor response (Mmax) measured at 1 x MTh; interside 3 = L/R size* difference; size** = % of Mmax measured at 1.5 x MTh; interside 4 = L/R size** difference. The present work extends and confirms our previous findings that the recruitment curve of the soleus H-reflex is the more appropriate test for detecting subclinical nerve root dysfunction at the S1 level[4, 7]. However, It must be emphasized that the finding of an abnormality in the recruitment of the H-reflex does not mean by itself that a patient has a radiculopathy. It is only in conjuction with the other standard electrodiagnostic techniques that this test can increase diagnostic sensitivity. In the common situation where subjects presented with no neurological deficit but only with symptoms suggestive of lumbosacral root irritation, such as in Group 1 patients (58%), an increase in the electrical threshold for eliciting the H-reflex was present compared with normal subjects. This result reached high significance using the M-threshold current as unity for quantification of stimulus intensity. To exclude the possibility that normalized H-threshold values might be distorted by a difference in the distribution of the M-thresholds, H-threshold current values were also expressed using a half-maximal M-wave as unity. This measurement also showed a significant rise in the H-theshold of patients compared with normal subjects. 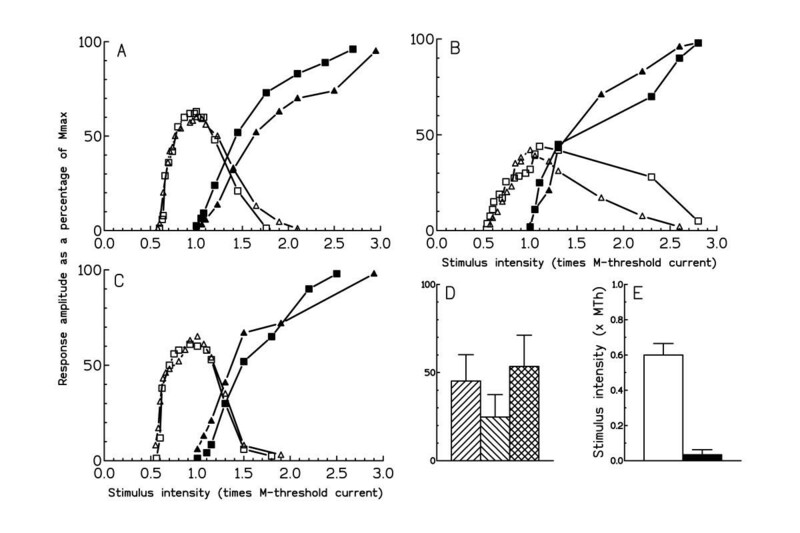 Normalization of stimulus intensities in clinical H-reflex testing is therefore recommended to reduce interindividual differences and variability in absolute H-response size due to peripheral factors. The increase in H-reflex threshold points to a reduced excitability of the largest sensory fibres, presumably because of partial conduction block at the root level.. When sensory and reflex alterations were present, such as in Group 2 patients (42%), additional abnormalities could be detected. We observed a significant attenuation of the amplitude of the soleus H-reflex. This could be due to axonal loss, conduction block or dispersion of the afferent volley and well correlates with the Achilles reflex reduction. It is worth stressing that the changes in H-reflex threshold and amplitude may precede any apparent slowing of conduction, given that the latency of the H-reflex was not delayed in the majority of the patients (85%). We never observed in parallel with the H-reflex alterations significant changes in the threshold and amplitude of the M-wave, nor was the decay phase of the H-reflex (which mainly depends on the increasing number of antidromically activated motor fibres) significantly altered in the patient populations compared with controls. The F-wave and needle EMG tests were also normal, suggesting a lack of motor root compromise. Human sensory and motor axons have been shown to differ in excitability in many ways[9, 10]. This difference may give rise to a differential susceptibility of sensory and motor axons in nerve root lesions. The large sensory fibres activated in the H-reflex pathway are extremely sensitive to the effects of cuff compression of the sciatic nerve. It may thus be hypothesized that the H-reflex changes here reported may be the expression of damage produced at S1 root level by mechanical/ischemic factors. The failure of imaging studies to provide evidence of anatomical involvement may due to several reasons. One such reason is that degenerative conditions of the lumbar spine are most likely to be very dynamic and as such cannot be fully appreciated by means of standard radiographic examinations. Another reason is that following mechanical deformation of spinal roots, there may be changes in root microcirculation and/or local release of inflammatory substances which can result in symptoms and electrophysiological abnormalities without CT/MRI changes. The study of the recruitment curve of the soleus H-reflex may be usefully associated to the F-wave and needle EMG study to detect possible S1 root dysfunction in mild lumbosacral radiculopathies. An increase in H-threshold may be the earliest abnormality in the in the absence of focal neurological signs. We wish to thank Prof.A.Rossi for many helpful discussions.